Telecommunications firm BT is to build a £20,000 underpass to help otters cross a busy road in Cornwall. The scheme, backed by the Environment Agency and English Nature, will see a tunnel sunk under the main Helston to St Keverne road. An otter and her cubs were killed on the road, next to BT's Goonhilly satellite complex, recently while fetching fish from a nearby quarry. Work on the underpass will start next month and take two weeks to complete. 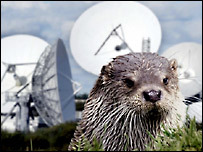 Goonhilly, which houses the world's largest earth satellite station, is a site of special scientific interest, and otters have been reintroduced there over recent years in a bid to stop a fall in numbers. Martin Rule, the Environment Agency biodiversity officer for West Cornwall said: "The small, re-colonising population of Lizard otters will continue to struggle crossing this road without help. "This could threaten their long-term viability so it's fantastic that BT has found the funding for this work."